← Josef Balejka – 07.02.2019. 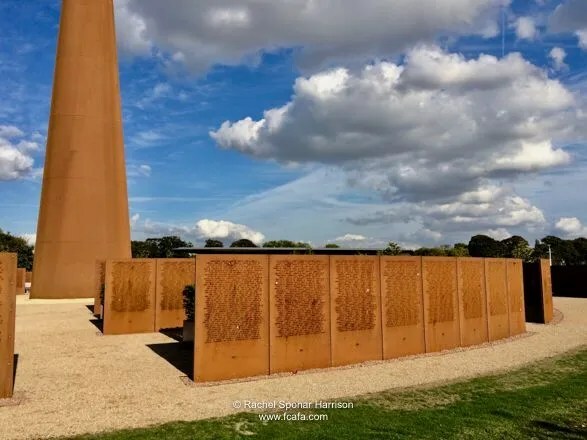 The International Bomber Command Centre (IBCC) at Lincoln, UK, with the Walls of Names, was unveiled on 12th April 2018. It serves as a point for recognition, remembrance and reconciliation for those who died whilst serving with RAF Bomber Command during WW2. 12. dubna 2018 bylo v Lincolnu, ve Velké Británii, otevřeno The International Bomber Command Centre (IBCC). 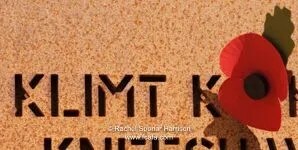 Jeho součástí jsou i Walls of Names, zdi, na nichž jsou uvedena jména všech padlých letců sloužících za druhé světové války pod Bomber Command RAF. Centrum bylo založeno jako místo, kde můžete poznávat historii Bomber Command, připomínat jeho statečné muže a tiše na ně vzpomenout. 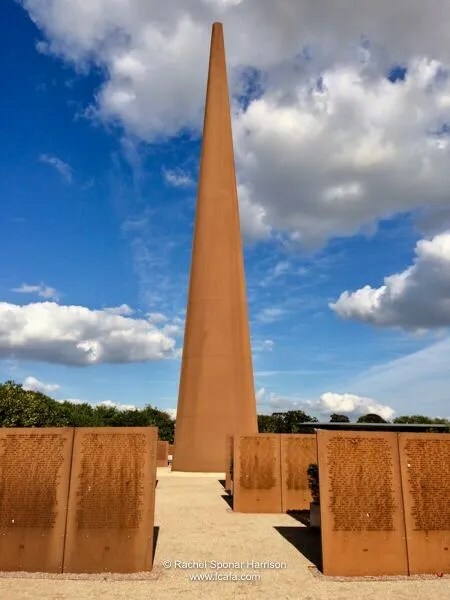 The Memorial Spire, central to IBCC, commemorates the airmen who served in RAF Bomber Command during WW2. Of the some 125, 000 airmen who served, 55,573 died. It is now recognised as the UK’s tallest war memorial. Memorial Spire, štíhlá věž v centru IBBC, připomíná letce, kteří sloužili pod Bomber Command Britského královského letectva v letech druhé světové války. Z celkového počtu přibližně 125 000 mužů jich padlo 55 573 (ztráty dosáhly 44,4 procent). Je nejvyšším válečným pomníkem v Británii. 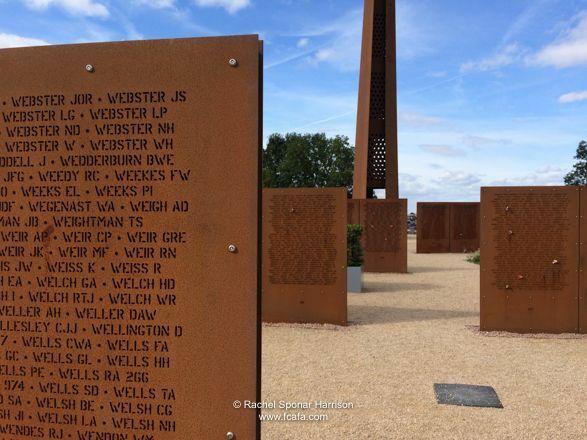 The Walls of Names surround the Memorial Spire in a series of panel circles framing the view of the City with a focus on the City’s ancient Cathedral, which served as a sighting point for RAF bomber crews flying from Lincolnshire during WW2. For many of the men named on the accompanying walls, the Cathedral provided their last sight of Britain. 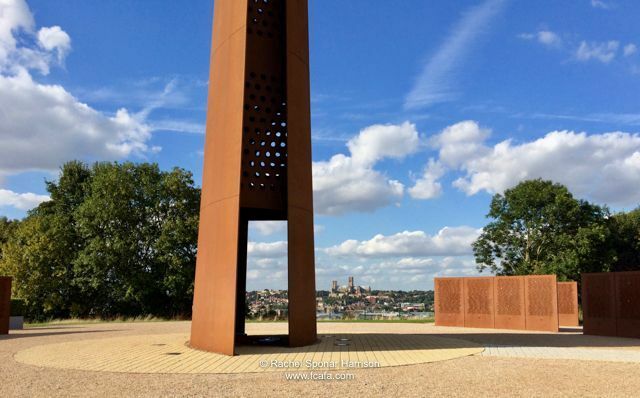 Each panel is formed from engraved sheets of Corten Weathering Steel. 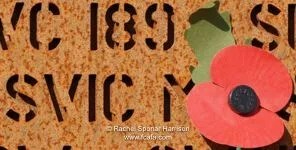 The Wall consists of 271 panels with the names of the 55,573 – a loss rate of 44.4% – RAF airmen, from 45 nations, who lost their lives serving in Bomber Command during WWII. 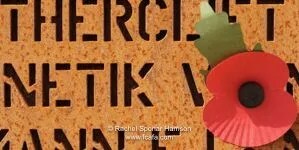 The IBCC is the only place in the world where all these losses are commemorated. Zeď je tvořena 271 panely se jmény těchto 55.573 letců RAF pocházejících ze 45 zemí, kteří položili své životy za druhé světové války ve službách Bomber Command RAF. Každý panel je složen z kovových desek vyrobených ze speciální COR-TEN oceli. IBCC je jediným místem na světě, kde jsou všechna tato jména připomínána. 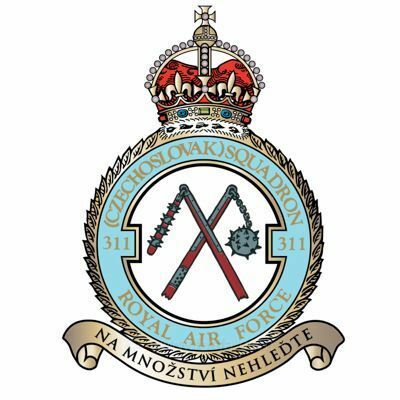 Whilst 311 Sqn was deployed in Bomber Command when based at Honnington and East Wreatham, between 29 July 1940 to 18 April 1942, 114 of its airmen were lost and are remembered on the Walls of Names. 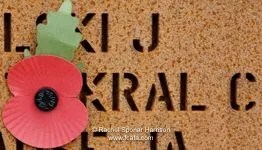 Od nasazení 311. československé bombardovací perutě pod velením Bomber Command, která působila mezi 29. červencem 1940 a 18. dubnem 1942 na základnách v Honningtonu a East Wreathamu, došlo ke ztrátě 114 jejích mužů. Bomb Aimer, 44 Sqn. – † 02/01/44, aged 21, Lancaster, KM-C, W4831, shot down and crashed 30 miles south of Berlin at Luckenwalde whilst on a bombing raid on Berlin. Grave at Berlin 1939-1945 War Cemetery. Air Gunner, 311 Sqn – † 16/10/40, aged 25, his Wellington N2771, hit barrage balloon at 21:45 and crashed near Bentley Priory, Middx with no survivors. Grave at Harrow [Pinner] New cemetery, London. Air Gunner, 311 Sqn. – † 20/07/41, aged 26, his Wellington KX-F R1371 shot down by night fighter over the North Sea following a bombing raid on Hanover, Germany. His body was never found and he is commemorated on panel 30 on the Runnymede Memorial. Air Gunner, 311 Sqn – † 15/09/41, aged 21, his Wellington R1015 shot down by flak over Holland whilst on a bombing raid to Hamburg, aircraft crashed near Andervenne, Germany. Grave at Reichswald Forest War Cemetery, Germany. Fitter II E, 311 Sqn – † 04/04/42, aged 28, killed in a motorcycle crash resulting from a bomb explosion in the immediate vicinity. Grave at St. Ethelbert churchyard, East Wretham, Norfolk. Pilot, 311 Sqn. – † 15/01/41, aged 24, lost in Wellington KX-Y T2519 missing in North Sea following raid on Wilhelmshaven. His body was never found and he is commemorated on panel 39 on the Runnymede Memorial. Air Gunner, 311 Sqn – † 04/03/42, aged 27, His Wellington, Z1147, was on a bombing raid on Emden, Germany, killed during an attack by a Luftwaffe night fighter. 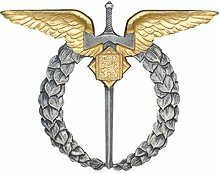 During the attack, he was seriously wounded in the head and stomach and died on the return flight from Emden. The Wellington landed safely back at East Wretham and his grave is at St. Ethelbert churchyard, East Wretham, Norfolk. Air Gunner, 311 Sqn – † 15/01/41, aged 27, lost in Wellington KX-Y T2519 missing in North Sea following a bombing raid on Wilhelmshaven. His body was never found and he is commemorated on panel 39 on the Runnymede Memorial. Navigator, 311 Sqn – † 17/01/42, aged 25, his Wellington, T2971, was on a bombing raid on Bremen, flak above the target damaged the aircraft causing it to crash near Tilburg, Holland. His grave is at Gilzerbaan General cemetery, Tilburg, Holland. Wireless Operator/Air Gunner, 311 Sqn. – † 12/03/42, aged 28, his Wellington KX-P R1802 crashed in the North Sea due to icing up whilst on a bombing raid to Keil. His body was never found and he is commemorated on panel 68 on the Runnymede Memorial. Wireless Operator/Air Gunner, 311 Sqn. – † 27/07/41, aged 23, Wellington KX-F R1371 shot down by night fighter over the North Sea following a bombing raid on Hanover. His body was never found and he is commemorated on panel 42 on the Runnymede Memorial. 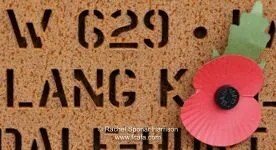 Pilot, 311 Sqn – † 03/03/42, aged 26, his Wellington KX-A Z1167 lost without trace on bombing raid on Paris. His body was never found and he is commemorated on panel 81 on the Runnymede Memorial. Pilot, 311 Sqn – † 23/10/41, aged 24, his Wellington T2624 crashed into the Irish Sea, off Cardigan Bay, during a training flight. His body was recovered and cremated. After WW2 the urn was repatriated back to Czechoslovakia. Wireless Operator / Air Gunner, 311 Sqn – † 02/07/41, aged 26, his Wellington R1515 was accidentally shot down by an RAF night fighter whilst returning from a bombing raid on Cherbourg. Aircraft crashed at Lower Park Farm at Mere, Wiltshire. He is buried at Devizes Road cemetery, Salisbury, Wiltshire. Wireless Operator / Air Gunner, 311 Sqn – † 25/05/41, aged 20, his Wellington N3010 crashed at the start of a training flight at Langham, Norfolk. His grave is at St. Ethelbert churchyard, East Wretham, Norfolk. Pilot, 311 Sqn. – † 2/03/42, aged 28, Wellington KX-P R1802 crashed in the North Sea due to iceing up whilst on a bombing raid to Keil. His body was never found and he is commemorated on panel 83 on the Runnymede Memorial. Pilot, 311 Sqn – † 03/03/42, aged 22, Wellington KX-A Z1167 lost without trace on a bombing raid on Paris. His body was never found and he is commemorated on panel 85 on the Runnymede Memorial. Navigator, 311 Sqn – † 02/07/41, aged 22, his Wellington R1515 was accidentally shot down by an RAF night fighter whilst returning from a bombing raid on Cherbourg. Aircraft crashed at Lower Park Farm at Mere, Wiltshire. He is buried at Devizes Road cemetery, Salisbury, Wiltshire. Pilot, 311 Sqn – † 14/05/42, aged 25, his Wellington Z1098 was damaged by flak over the target on a bombing raid on Dortmund, on the return flight was shot down by a Luftwaffe Me110 over Holland and crashed near Boshoven, northwest of Weert. He is buried at Woensel General Cemetery, near Eindhoven, Holland. Air Gunner, 311 Sqn – † 23/06/41, aged 26, his Wellington KX-T T2990 returning from a bombing raid on Bremen shot down by night fighter over the North Sea 20 km West of Petten, Holland. His body was never found and he is commemorated on panel 36 on the Runnymede Memorial. Pilot, 311 Sqn – † 02/07/41, aged 25, his Wellington R1515 was accidentally shot down by an RAF night fighter whilst returning from a bombing raid on Cherbourg. Aircraft crashed at Lower Park Farm at Mere, Wiltshire. He is buried at Devizes Road cemetery, Salisbury, Wiltshire. Pilot, 311 Sqn – † 03/03/42, aged 26, his Wellington Ic, KX-Y Z1070, was shot down near Creil, France, whilst on a bombing raid to Paris. He is buried at Creil Communal Cemetery. Air Gunner, 311 Sqn – † 11/04/42, aged 30, his Wellington KX-Z, Z8838, was shot down by a Luftwaffe night fighter while returning from a bombing raid on Essen. Aircraft crashed 4.5 km east of Kolhorn, Holland. All the crew were killed and initially buried at Middenmeer, Holland, five in a communal grave and one in a separate grave. In 2004 the remains were re-interred at Bergen op Zoom War Cemetery, Holland. Navigator, 311 Sqn – † 15/01/41, aged 28, lost in Wellington KX-Y, T2519, missing in the North Sea following a raid on Wilhelmshaven. He is remembered on panel 30 on the Runnymede Memorial. Pilot, 311 Sqn. – † 23/10/41, aged 24, Wellington T2624 crashed on a training flight into the Irish Sea, off Cardigan, Wales. His body was never recovered and is He is remembered on panel 45 on the Runnymede Memorial. Wireless Operator/Air Gunner, 311 Sqn – † 03/03/42, aged 19, Wellington KX-A Z1167 lost without trace on a bombing raid on Paris. His body was never found and he is commemorated on panel 86 on the Runnymede Memorial. Air Gunner 311 Sqn – † 16/12/40, aged 23, his Wellington KX-Q, T2577, crashed at East Wretham on take-off for a bombing raid on Mannheim, Germany. He is buried at All Saints churchyard, Honington, Suffolk. Wireless Operator/Air Gunner, 311 Sqn – † 23/10/41, aged 28, Wellington T2624 crashed on a training flight into the Irish Sea, off Cardigan, Wales. His body was never recovered and he is remembered on panel 46 on the Runnymede Memorial. Air Gunner, 311 Sqn – † 15/09/41, aged 23, Wellington R1015 shot down by flak over Holland whilst on a bombing raid to Hamburg, aircraft crashed near Andervenne, Germany. He is buried at Reichswald Forest War Cemetery, Germany. Navigator, 311 Sqn – † 16/10/40, aged 30, Wellington bomber KX-T, L7844, whilst on a bombing raid to Keil, shot down at 21:25 by a Luftwaffe night fighter. Aircraft crashed at Doornspijk, southwest of Oosterwelde, Holland. He is buried at Oosterwolde General cemetery, Oldebroek, Holland. Pilot, 311 Sqn – † 20/07/41, aged 25, Wellington KX-F R1371 shot down by night fighter over the North Sea following a bombing raid on Hanover, Germany. The aircraft crashed into the Waddenzee, Holland. He is buried at Uithuizermeeden General Cemetery, Holland. Wireless Operator / Air Gunner, 311 Sqn – † 16/10/40, aged 33, Wellington bomber KX-T, L7844, whilst on a bombing raid to Keil, shot down at 21:25 by a Luftwaffe night fighter. Aircraft crashed at Doornspijk, southwest of Oosterwelde, Holland. He is buried at Oosterwolde General cemetery, Oldebroek, Holland. Pilot, 311 Sqn – † 11/04/42, aged 25, his Wellington KX-Z, Z8838, was shot down by a Luftwaffe night fighter while returning from a bombing raid on Essen. Aircraft crashed 4.5 km east of Kolhorn, Holland. All the crew were killed and initially buried at Middenmeer, Holland, five in a communal grave and Josef KALENSKÝ in a separate grave. In 2004 the remains were re-interred at Bergen op Zoom War Cemetery, Holland. Wireless Operator / Air Gunner, 311 Sqn – † 16/10/40, aged 28, Wellington bomber KX-T, L7844, whilst on a bombing raid to Keil, shot down at 21:25 by a Luftwaffe night fighter. Aircraft crashed at Doornspijk, southwest of Oosterwelde, Holland. He is buried at Oosterwolde General cemetery, Oldebroek, Holland. Pilot, 311 Sqn – † 11/04/42, aged 21, his Wellington KX-Z, Z8838, was shot down by a Luftwaffe night fighter while returning from a bombing raid on Essen. Aircraft crashed 4.5 km east of Kolhorn, Holland. All the crew were killed and initially buried at Middenmeer, Holland, Karel KODEŠ and four others in a communal grave and one in a separate grave. In 2004 the remains were re-interred at Bergen op Zoom War Cemetery, Holland. Navigator, 311 Sqn. – † 03/06/41, aged 26, Wellington KX-T T2990 returning from a bombing raid on Bremen, Germany, shot down by night fighter over the North Sea 20 km West of Petten, Holland. His body was never recovered and he is remembered on panel 33 on the Runnymede Memorial. Air Gunner, 311 Sqn. – † 03/03/42, aged 40, his Wellington Ic, KX-Y Z1070, was shot down near Creil, France, whilst on a bombing raid to Paris. He is buried at Creil Communal Cemetery. Wireless Operator, 311 Sqn – † 17/04/41, aged 25, his Wellington R1599 shot down by Me110 night fighter whilst returning from a bombing raid on Cologne, Germany. Aircraft crashed at 23:39 at Kelpen (Limburg) 9 km South East of Weert, Holland. No survivors from the crash. He is buried at Jonkerbos War Cemetery, Nijmegen, Holland. Pilot, 311 Sqn – † 03/03/42, aged 24, his Wellington Ic, KX-Y Z1070, was shot down near Creil, France, whilst on a bombing raid to Paris. He is buried at Creil Communal Cemetery. Pilot, 311 Sqn – † 01/10/40, aged 25, his Wellington R9649 crashed at Elton, Peterborough during a training flight. He is buried at Eastfield cemetery, Peterborough. Pilot, 311 Sqn – † 17/04/41, aged 24, his Wellington R1599 shot down by Me110 night fighter whilst returning from a bombing raid on Cologne, Germany. Aircraft crashed at 23:39 at Kelpen (Limburg) 9 km South East of Weert, Holland. No survivors from the crash. He is buried at Jonkerbos War Cemetery, Nijmegen, Holland. Wireless Operator/Air Gunner, 311 Sqn. – † 21/01/42, aged 21, his Wellington KX-D DV515 lost without trace in the North Sea on following a bombing raid to Bremen, Germany. His body was never found and he is commemorated on panel 87 on the Runnymede Memorial. Air Gunner, 311 Sqn. – † 15/01/41, aged 27, lost in Wellington KX-Y T2519 missing in North Sea following raid on Wilhelmshaven. His body was never found and he is commemorated on panel 33 on the Runnymede Memorial. Pilot, 311 Sqn – † 16/12/40, aged 27, his Wellington KX-Q, T2577, crashed at East Wretham on take-off for a bombing raid on Mannheim, Germany. He is buried at All Saints churchyard, Honington, Suffolk. Navigator, 311 Sqn. – † 17/04/41, aged 27, his Wellington R1599 shot down by Me110 night fighter whilst returning from a bombing raid on Cologne, Germany. Aircraft crashed at 23:39 at Kelpen (Limburg) 9 km South East of Weert, Holland. No survivors from the crash. He is buried at Jonkerbos War Cemetery, Nijmegen, Holland. Pilot, 311 Sqn. – † 15/01/41, aged 29, lost in Wellington KX-Y T2519 missing in North Sea following raid on Wilhelmshaven. His body was never found and he is commemorated on panel 30 on the Runnymede Memorial. Navigator, 311 Sqn – † 12/03/42, aged 27, Wellington KX-P R1802 crashed in the North Sea due to icing up whilst on a bombing raid to Keil. His body was never found and he is commemorated on panel 66 on the Runnymede Memorial. Wireless Operator, 311 Sqn – † 25/09/40, aged 27, Wellington L7788 damaged by flak above target, whilst on a bombing raid on Berlin, Germany. Aircraft crashed South of Gravenhage, Holland. He survived the crash but shot himself with a flare pistol rather than be captured. His grave is at The Hague [Westduin] General cemetery, The Hague, Holland. Wireless Operator, 311 Sqn – † 02/07/4, aged 20, his Wellington R1515 was accidentally shot down by an RAF night fighter whilst returning from a bombing raid on Cherbourg. Aircraft crashed at Lower Park Farm at Mere, Wiltshire. 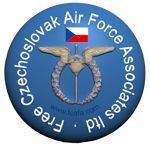 After WW2 his remains were repatriated back to Czechoslovakia. Pilot, 311 Sqn – † 16/10/40, aged 43, Wellington bomber KX-T, L7844, whilst on a bombing raid to Keil, shot down at 21:25 by a Luftwaffe night fighter. Aircraft crashed at Doornspijk, southwest of Oosterwelde, Holland. He is buried at Oosterwolde General cemetery, Oldebroek, Holland. Pilot, 311 Sqn – † 17/10/40, aged 24, his Wellington L7786, crashed near Coddenham, Suffolk, during a training flight. He is buried at All Saints churchyard, Honington, Suffolk. Wireless Operator, 311 Sqn – † 15/01/41, aged 23, lost in Wellington KX-Y T2519 missing in the North Sea following a bombing raid on Wilhelmshaven. His body was never found and he is commemorated on panel 33 on the Runnymede Memorial. Interpreter, 311 Sqn – † 05/01/41, aged 19, killed in an air raid on East Wretham. He is burie at St. Ethelbert churchyard, East Wretham, Norfolk. Air Gunner, 311 Sqn – † 17/04/41, aged 30, his Wellington R1599 shot down by Me110 night fighter whilst returning from a bombing raid on Cologne, Germany. Aircraft crashed at 23:39 at Kelpen (Limburg) 9 km South East of Weert, Holland. No survivors from the crash. He is buried at Jonkerbos War Cemetery, Nijmegen, Holland. Pilot, 311 Sqn – † 16/11/41, aged 26, Wellington KX-E Z8966 damaged by flak during a bombing raid on Keil, Germany. On return flight crashed in Irish Sea, 20 km South West off St Bees Head, Cumberland. His body was never found and he is commemorated on panel 47 on the Runnymede Memorial. Air Gunner, 311 Sqn – † 17/07/41, aged 25, his Wellington KX-N, R1718, was shot down at 00:50 by by a Luftwaffe Me110 on a bombing raid to Hamburg, Germany. The Wellington crashed in the Zuiderzee off the island of Ijsselmeer 5km west of Lemmer, Holland. He was killed in the crash and is buried at Lemmer General Cemetery, Lemsterland, Holland. Wireless Operator / Air Gunner, 311 Sqn – † 17/01/42, aged 23, his Wellington, T2971, was on a bombing raid on Bremen, flak above the target damaged the aircraft causing it to crash near Tilburg, Holland. His grave is at Gilzerbaan General cemetery, Tilburg, Holland. Wireless Operator, 311 Sqn – † 16/10/40, aged 25, Wellington N2771, hit barrage balloon at 21:45 and crashed near Bentley Priory, Middx with no survivors. Grave at Harrow [Pinner] New cemetery, London. Wireless Operator/Air Gunner, 311 Sqn. – † 12/03/42, aged 30, Wellington KX-P R1802 crashed in the North Sea due to icing up whilst on a bombing raid to Keil. His body was never found and he is commemorated on panel 89 on the Runnymede Memorial. Pilot, 311 Sqn. – † 15/09/41, aged 25, Wellington R1015 shot down by flak over Holland whilst on a bombing raid to Hamburg, aircraft crashed near Andervenne, Germany. Grave at Reichswald Forest War Cemetery, Germany. Navigator, 311 Sqn. – † 02/01/42, aged 29, his Wellington KX-B T2553 lost in the North Sea, off the Dutch coast, following a raid on Wilhelmshaven. He survived the crash but died from exposure in a dinghy during the six days at sea. He is buried at Bergen General Cemetery, Bergen, Holland. Air Gunner, 311 Sqn. – † 21/01/42, aged 24, his Wellington KX-D DV515 lost without trace in the North Sea on following a bombing raid to Bremen, Germany. His body was never found and he is commemorated on panel 90 on the Runnymede Memorial. Pilot, 311 Sqn – † 20/07/41, aged 30, Wellington KX-F, R1371, shot down by night fighter over the North Sea following a bombing raid on Hanover, Germany. He is buried at Oldebroek General cemetery, Oldebroek, Holland. Navigator, 311 Sqn – † 20/07/41, aged 30, Wellington KX-F R1371 shot down by night fighter over the North Sea following a bombing raid on Hanover. He is buried at Sage War Cemetery, Oldenburg, Germany. Wireless Operator/Air Gunner, 311 Sqn – † 11/04/42, aged 22, his Wellington KX-Z, Z8838, was shot down by a Luftwaffe night fighter while returning from a bombing raid on Essen. Aircraft crashed 4.5 km east of Kolhorn, Holland. All the crew were killed and initially buried at Middenmeer, Holland, five in a communal grave and one in a separate grave. In 2004 the remains were re-interred at Bergen op Zoom War Cemetery, Holland. Wireless Operator/Air Gunner, 311 Sqn – † 02/07/41, aged 20, his Wellington R1515 was accidentally shot down by an RAF night fighter whilst returning from a bombing raid on Cherbourg. Aircraft crashed at Lower Park Farm at Mere, Wiltshire. He is buried at Devizes Road cemetery, Salisbury, Wiltshire. Pilot, 311 Sqn – † 21/01/42, aged 29, his Wellington KX-D, DV515, lost without trace in the North Sea on following a bombing raid to Bremen, Germany. His body was never found and he is commemorated on panel 75 on the Runnymede Memorial. Pilot, 311 Sqn – † 02/07/41, aged 29, his Wellington R1515 was accidentally shot down by an RAF night fighter whilst returning from a bombing raid on Cherbourg. Aircraft crashed at Lower Park Farm at Mere, Wiltshire. He is buried at Devizes Road cemetery, Salisbury, Wiltshire. Air Gunner, 311 Sqn – † 03/03/42, aged 26, Wellington KX-A Z1167 lost without trace on a bombing raid on Paris. His body was never found and he is commemorated on panel 91 on the Runnymede Memorial. Air Gunner, 311 Sqn – † 03/10/41, aged 21, his Wellington T2624 crashed into the Irish Sea, off Cardigan Bay, during a training flight. His body was never found and he is commemorated on panel 50 on the Runnymede Memorial. Pilot, 138 Sqn – † 10/03/42, aged 22, his Whitley NF-A, Z9125, crashed shortly after take-off from Stradishall airfield on an SOE flight, Operation Frensham I, to occupied France. The aircraft caught fire on crashing, killing five of the crew members. His remains were cremated and the urn returned to Czechoslovakia after WW2. Wireless Operator/Air Gunner, 311 Sqn – † 12/03/42, aged 28, Wellington KX-P R1802 crashed in the North Sea due to icing up whilst on a bombing raid to Keil. His body was never found and he is commemorated on panel 92 on the Runnymede Memorial. Navigator, 311 Sqn – † 03/03/42, aged 25, Wellington KX-A Z1167 lost without trace on bombing raid on Paris. His body was never found and he is commemorated on panel 66 on the Runnymede Memorial. Pilot, 311 Sqn – † 23/10/41, aged 26, his Wellington T2624 crashed on a training flight into the Irish Sea, off Cardigan, Wales. His body was never recovered and is He is remembered on panel 51 on the Runnymede Memorial. Wireless Operator/Air Gunner, 311 Sqn. – † 21/01/42, aged 23, his Wellington KX-D DV515 lost without trace in the North Sea on following a bombing raid to Bremen, Germany. His body was never found and he is commemorated on panel 92 on the Runnymede Memorial. Pilot, 311 Sqn – † 23/06/41, aged 28, his Wellington KX-T T2990 returning from a bombing raid on Bremen shot down by night fighter over the North Sea 20 km West of Petten, Holland. His body was never found and he is commemorated on panel 37 on the Runnymede Memorial. Navigator, 311 Sqn – † 11/04/42, aged 23, his Wellington KX-Z, Z8838, was shot down by a Luftwaffe night fighter while returning from a bombing raid on Essen. Aircraft crashed 4.5 km east of Kolhorn, Holland. All the crew were killed and initially buried at Middenmeer, Holland, five in a communal grave and one in a separate grave. In 2004 the remains were re-interred at Bergen op Zoom War Cemetery, Holland. Navigator, 311 Sqn – † 15/09/41, aged 27, his Wellington R1015 shot down by flak over Holland whilst on a bombing raid to Hamburg, aircraft crashed near Andervenne, Germany. Grave at Reichswald Forest War Cemetery, Germany. Pilot, 311 Sqn – † 17/04/41, aged 27, his Wellington R1599 shot down by Me110 night fighter whilst returning from a bombing raid on Cologne, Germany. Aircraft crashed at 23:39 at Kelpen (Limburg) 9 km South East of Weert, Holland. No survivors from the crash. He is buried at Jonkerbos War Cemetery, Nijmegen, Holland. Air Gunner, 311 Sqn. – † 08/12/41, aged 23, his Wellington KX-B T2553 lost in the North Sea, off the Dutch coast, following a raid on Wilhelmshaven. His body was never found and he is commemorated on panel 52 on the Runnymede Memorial. Navigator, 311 Sqn – † 03/03/42, aged 24, his Wellington KX-D DV515 lost without trace in the North Sea on following a bombing raid to Bremen, Germany. His body was never found and he is commemorated on panel 66 on the Runnymede Memorial. Wireless Operator/Air Gunner, 311 Sqn. – † 16/11/41, aged 20, Wellington KX-E Z8966 damaged by flak on a bombing raid on Keil, on return flight crashed in the Irish Sea, 20 km SW off St Bees Head, Cumberland. Wireless Operator/Air Gunner, 311 Sqn – † 01/10/40, aged 30, his Wellington R9649 crashed at Elton, Peterborough during a training flight. He is buried at Eastfield cemetery, Peterborough. Navigator, 311 Sqn – † 16/10/40, aged 25, his Wellington N2771, hit barrage balloon at 21:45 and crashed near Bentley Priory, Middx with no survivors. Grave at Harrow [Pinner] New cemetery, London. Pilot, 311 Sqn – † 01/10/40, aged 28, his Wellington R9649 crashed at Elton, Peterborough during a training flight. He is buried at Eastfield cemetery, Peterborough. Wireless Operator, 311 Sqn. – † 23/06/41, aged 25, his Wellington KX-T T2990 returning from a bombing raid on Bremen shot down by night fighter over the North Sea 20 km West of Petten, Holland. His body was never found and he is commemorated on panel 34 on the Runnymede Memorial. Pilot, 311 Sqn. – † 12/03/42, aged 21, his Wellington KX-P R1802 crashed in the North Sea due to icing up whilst on a bombing raid to Keil. His body was never found and he is commemorated on panel 94 on the Runnymede Memorial. Pilot, 311 Sqn – † 15/09/41, aged 27, his Wellington R1015 shot down by flak over Holland whilst on a bombing raid to Hamburg, aircraft crashed near Andervenne, Germany. Grave at Reichswald Forest War Cemetery, Germany. Wireless Operator/Air Gunner, 311 Sqn – † 03/03/42, aged 22, his Wellington KX-A Z1167 lost without trace on a bombing raid on Paris. His body was never found and he is commemorated on panel 81 on the Runnymede Memorial. Air Gunner, 311 Sqn – † 17/04/41, aged 26, his Wellington R1599 shot down by Me110 night fighter whilst returning from a bombing raid on Cologne, Germany. Aircraft crashed at 23:39 at Kelpen (Limburg) 9 km South East of Weert, Holland. No survivors from the crash. He is buried at Jonkerbos War Cemetery, Nijmegen, Holland. Wireless Operator / Air Gunner, 311 Sqn – † 25/05/41, aged 22, Wellington N3010 crashed at the start of a training flight at Langham, Norfolk. His grave is at St. Ethelbert churchyard, East Wretham, Norfolk. Air Gunner, 311 Sqn – † 03/03/42, aged 22, his Wellington Ic, KX-Y Z1070, was shot down near Creil, France, whilst on a bombing raid to Paris. He is buried at Creil Communal Cemetery. Pilot, 311 Sqn – † 04/06/41, aged 24, his Wellington N3010 crashed at the start of a training flight at Langham, Norfolk. His grave is at St. Ethelbert churchyard, East Wretham, Norfolk. Pilot, 311 Sqn – † 17/01/42, aged 24, his Wellington, T2971, was on a bombing raid on Bremen, flak above the target damaged the aircraft causing it to crash near Tilburg, Holland. His grave is at Gilzerbaan General cemetery, Tilburg, Holland. Wireless Operator / Air Gunner, 311 Sqn – † 03/03/42, aged 30, his Wellington Ic, KX-Y Z1070, was shot down near Creil, France, whilst on a bombing raid to Paris. He is buried at Creil Communal Cemetery. Wireless Operator / Air Gunner, 311 Sqn – † 14/04/42, aged 33, his Wellington Z1098 was damaged by flak over the target on a bombing raid on Dortmund, on the return flight was shot down by a Luftwaffe Me110 over Holland and crashed near Boshoven, northwest of Weert. He is buried at Woensel General Cemetery, near Eindhoven, Holland. Navigator, 311 Sqn – † 03/03/42, aged 27, his Wellington Ic, KX-Y Z1070, was shot down near Creil, France, whilst on a bombing raid to Paris. He is buried at Creil Communal Cemetery. Pilot, 311 Sqn – † 02/01/42, aged 23, his Wellington KX-B T2553 lost in the North Sea, off the Dutch coast, following a raid on Wilhelmshaven. He survived the crash but died from exposure in a dinghy during the six days at sea. He is remembered on panel 53 at the Runnymede Memorial. Pilot, 311 Sqn – † 17/10/40, aged 23, his Wellington L7786, crashed near Coddenham, Suffolk, during a training flight. He is buried at All Saints churchyard, Honington, Suffolk. Air Gunner, 311 Sqn – † 16/12/40, aged 23, his Wellington KX-Q, T2577, crashed at East Wretham on take-off for a bombing raid on Mannheim, Germany. He is buried at All Saints churchyard, Honington, Suffolk. Air Gunner, 311 Sqn. – † 16/11/41, aged 24, Wellington KX-E Z8966 damaged by flak during a bombing raid on Keil, Germany. On return flight crashed in Irish Sea, 20 km South West off St Bees Head, Cumberland. His body was never found and he is commemorated on panel 53 on the Runnymede Memorial. Air Gunner, 311 Sqn – † 23/06/41, aged 23, his Wellington KX-T T2990 returning from a bombing raid on Bremen shot down by night fighter over the North Sea 20 km West of Petten, Holland. His body was never found and he is commemorated on panel 37 on the Runnymede Memorial. Wireless Operator, 311 Sqn – † 31/03/44, aged 31, Captured when the navigator of his Wellington, L7842, became disorientated and landed in error on a Luftwaffe airfield, near Bolougne, France. All the crew were captured and became prisoners of war. He was one of the 76 Allied airmen who participated in the Great Escape from Stalag Luft III PoW camp in Poland. Shortly after he was captured and was one of the 50 Allied airmen who were executed by the Gestapo in reprisal for that escape. His ashes are interred at the Old Garrison Cemetery, Poznan, Poland. Air Gunner, 311 Sqn. – † 20/07/41, aged 26, his Wellington KX-F R1371 shot down by night fighter over the North Sea following a bombing raid on Hanover, Germany. His body was never found and he is commemorated on panel 54 on the Runnymede Memorial. Pilot, 311 Sqn. – † 01/10/40, aged 24, his Wellington R9649 crashed at Elton, Peterborough during a training flight. He is buried at Eastfield cemetery, Peterborough. Wireless Operator / Air Gunner, 311 Sqn – † 14/04/42, aged 30, his Wellington Z1098 was damaged by flak over the target on a bombing raid on Dortmund, on the return flight was shot down by a Luftwaffe Me110 over Holland and crashed near Boshoven, northwest of Weert. He is buried at Woensel General Cemetery, near Eindhoven, Holland. 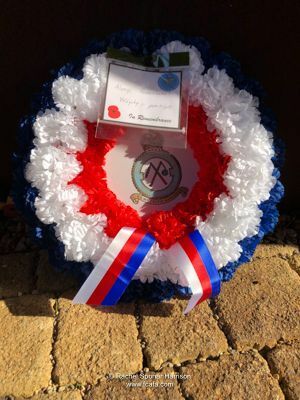 Wireless Operator, 311 Sqn – † 17/10/40, aged 29, his Wellington N2773, KX-X, became iced up whilst returning from a bombing mission to Bremen, Germany. Having managed to reach the UK coast, the Captain, Flt/Lt Josef Šnajdr, ordered the crew to bail-out. He landed safely near East Farm, West Willoughby, Grantham, Lincolnshire, but was accidentally shot dead by a member of the Home Guard. He is buried at All Saints churchyard, Honington, Suffolk. Pilot, 311 Sqn – † 16/10/40, aged 34, his Wellington N2771, hit barrage balloon at 21:45 and crashed near Bentley Priory, Middx with no survivors. Grave at Harrow [Pinner] New cemetery, London. Pilot, 311 Sqn – † 21/01/42, aged 32, his Wellington KX-D DV515 lost without trace in the North Sea on following a bombing raid to Bremen, Germany. His body was never found and he is commemorated on panel 73 on the Runnymede Memorial. Pilot, 311 Sqn – † 16/10/40, aged 30, his Wellington N2771, hit barrage balloon at 21:45 and crashed near Bentley Priory, Middx with no survivors. Grave at Harrow [Pinner] New cemetery, London. Pilot, 311 Sqn – † 26/05/41, aged 25, his Wellington N3010 crashed at the start of a training flight at Langham, Norfolk. His grave is at St. Ethelbert churchyard, East Wretham, Norfolk. Wireless Operator, 311 Sqn – † 15/09/41, aged 27, his Wellington R1015 shot down by flak over Holland whilst on a bombing raid to Hamburg, aircraft crashed near Andervenne, Germany. Grave at Reichswald Forest War Cemetery, Germany. The IBCC is located 2.6 miles to the south of the centre of Lincoln and is close to the villages of Canwick and Bracebridge Heath. Access to the site is from Canwick Avenue B1131. It is recommended from Bracebridge Heath (A15) and turning left into the site. IBCC se nachází 2,6 míle na jih od centra Lincolnu, nedaleko vesnic Canwick a Bracebridge Heath. Vstup do areálu je z Canwick Avenue na silnici B1131. Doporučujeme vám cestu přes Bracebridge Heath (A15), do areálu odbočíte vlevo. Adresa: International Bomber Command Centre, Cannock Hill, Cannock, Lincoln, LN4 2HQ. The assistance of Rachel and Peter Sponar-Harrison with this article is very much appreciated. Velmi si ceníme spolupráce Rachel a Petera Sponar-Harrison při vzniku tohoto článku.